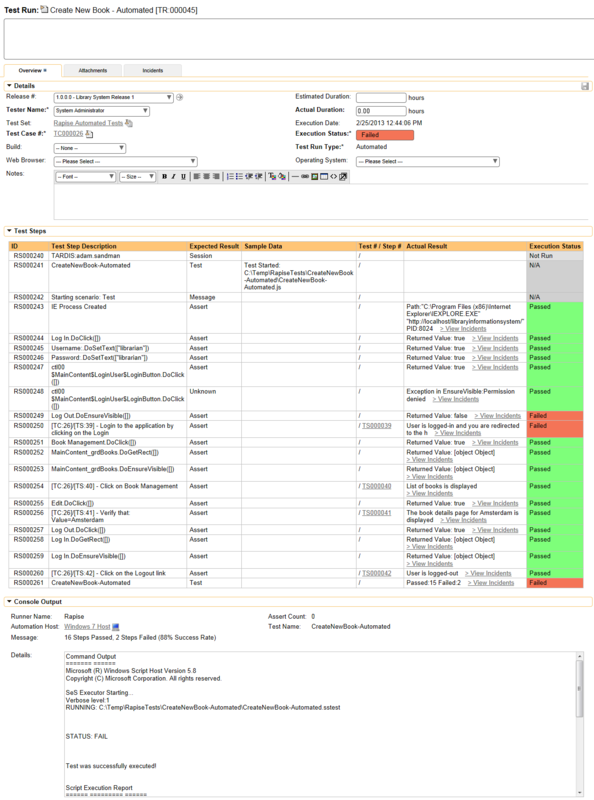 SpiraTest is a web-based quality assurance and test management system with integrated release scheduling and defect tracking. 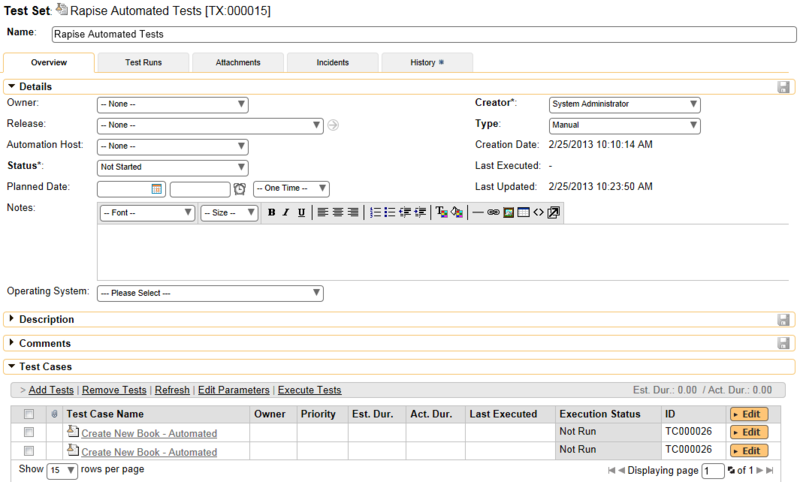 SpiraTest includes the ability to execute manual tests, record the results and log any associated defects. You can record and create your test cases using Rapise, upload them to SpiraTest and then schedule the tests to be executed on multiple remote computers to execute the tests immediately or according to a predefined schedule. The results are then reported back to SpiraTest where they are archived as part of the project. Also the test results can be used to update requirements' test coverage and other key metrics in real-time. In addition, you can also create exploratory manual tests, save them to SpiraTest and then execute them from within Rapise. This gives you access to more powerful screen capture and annotation functionality than is possible solely using SpiraTest. Note: SpiraTeam is an integrated ALM Suite that includes SpiraTest as part of its functionality, so wherever you see references to SpiraTest in this section, it applies equally to SpiraTeam. 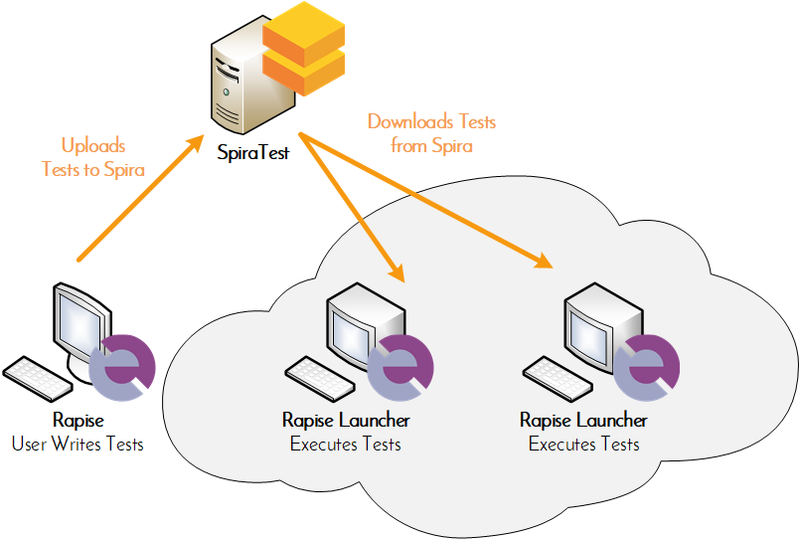 Before you can use SpiraTest to manage your Rapise automated tests you need to perform some initial configuration. This section assumes that you already have a working installation of SpiraTest or SpiraTeam v4.2 or later. If not, please refer to the SpiraTest Installation and Administration Guide for details on how to install SpiraTest. Log in to SpiraTest as a system administrator and go into SpiraTest main Administration page and click on the Test Automation link under Integration. Note: Depending on when you first installed SpiraTest, you may already have an entry for Rapise, since versions 3.2 and later of SpiraTest automatically ship with a default entry for Rapise. Name: This is the short display name of the automation engine. It can be anything that is meaningful to your users. Active: If checked, the engine is active and able to be used for any project. Token: This needs to be the assigned unique token for the automation engine and is used to tell SpiraTest which engine to actually use for a given test case. For Rapise this should always be set to Rapise. Enter the URL, login and password that you use to connect to SpiraTest and then click the Test button to verify that the connection information is correct. The "Default Repository Path" is a folder that used to store local copies of the non-absolute repositories. The Token is the identifier of the current machine that Rapise is installed on. It needs to match the 'Token' name of the corresponding 'Automation Host' in SpiraTest. You need to be running SpiraTest / SpiraTeam v4.0 or later to use the integration with Rapise. 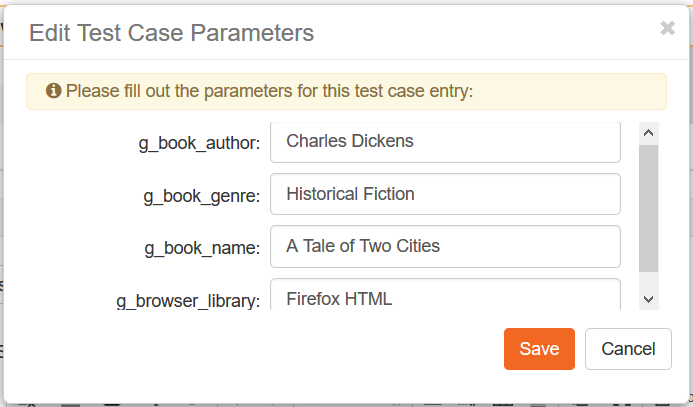 Select the project that has our new test case. 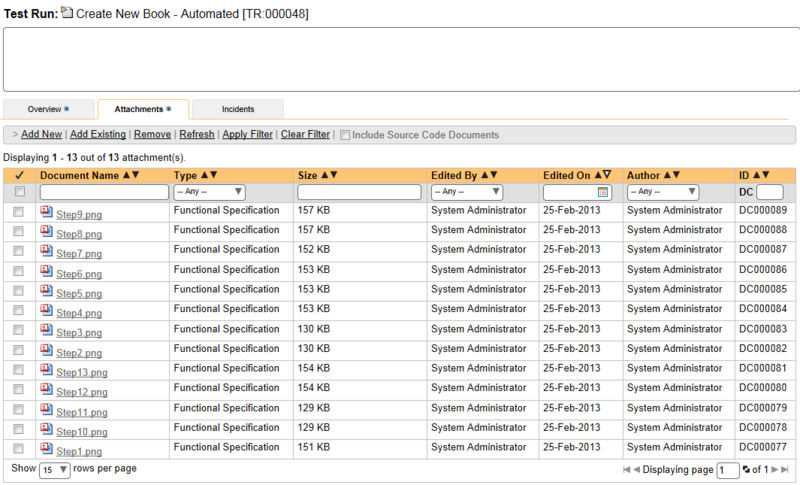 The list of test case folders will be displayed. If you used an existing SpiraTest manual test case then most likely it already has test steps defined. Otherwise, if you created a new test case, there will be no manual test steps and no automated script. In which case we need to first add the manual test steps to the test case. You have a project created in SpiraTest to store the Rapise tests in. The Rapise tests will be stored in a repository located inside the Planning > Documents section of the project. The user you will be connecting to SpiraTest with has the permissions to create new document folders. You have created the Test Case in SpiraTest that the Rapise test will be associated with. This is important because without being associated to a SpiraTest Test Case, you will not be able to schedule and execute the tests using SpiraTest and RapiseLauncher. You have created an AutomationEngine in SpiraTest that has the token name "Rapise". This will be used to identify Rapise automation scripts inside SpiraTest. Once you have setup SpiraTest accordingly, click File > Save to Spira. The first thing you will need to do is choose the SpiraTest project from the dropdown list. 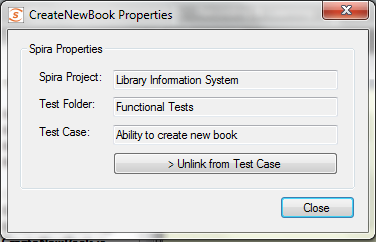 This will then update the list of test case folders displayed in the top pane of the dialog box. - Test case that has an existing Rapise test attached. - Test case that has a non-Rapise automation script attached. If you are adding a new Rapise test, choose a test case that has icon (1) and doesn't have an associated Repository path. 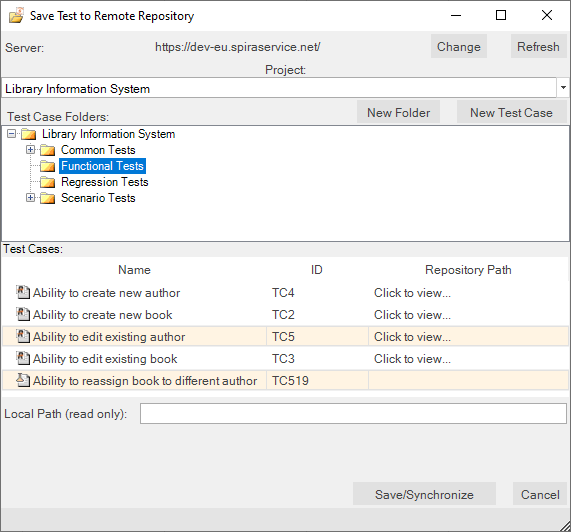 If you are updating an existing test, choose a test case that has icon (2) and the matching Repository path. Note: test cases with icon type (3) cannot be used with Rapise for adding or updating scripts. This dialog box will let you know where the Rapise script will be stored in SpiraTest and also the location of the repository local directory used to store the 'working copy' of the Rapise test. Click Create to confirm. If an error occurs during the save, a message box will be displayed, otherwise the dialog box will simply close. You have already configured the connection to the SpiraTest service (see the instructions at the top of this page). The user you will be connecting to SpiraTest with has the permission to view the project that the tests are being stored in. 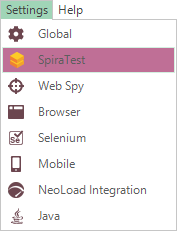 Once you have setup SpiraTest accordingly, click on the File > Open Test from Spira menu. The first thing you will need to do is choose the SpiraTest project from the dropdown list. Once you have done that, the system will display the list of test case folders in this project. 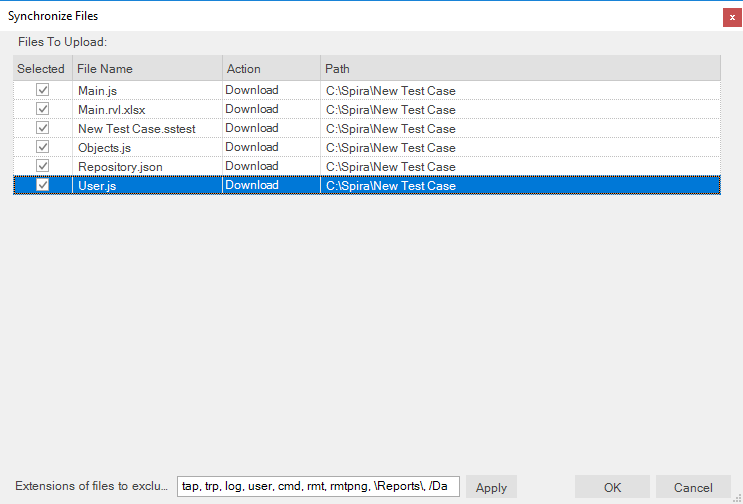 When you expand the folders to display the list of contained test cases, it will display the name of the associated Rapise test script associated with it (to the right). 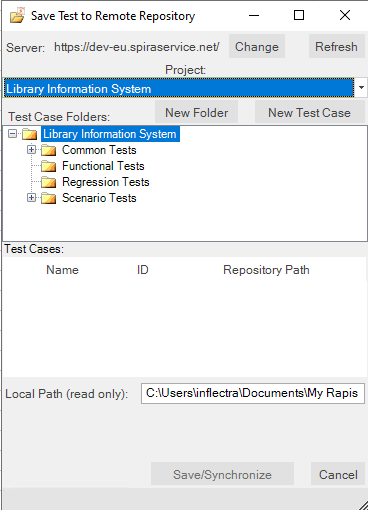 Choose a test case that has the matching Rapise test case listed to the right of it (in the Repository Path column). 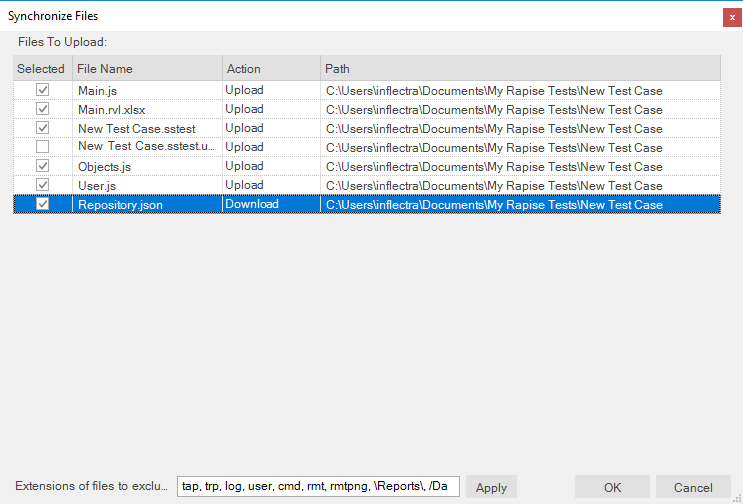 Note: Only test cases that have an attached Rapise test script will be displayed in this view. The system will display the message that it's downloading the files from the server. If an error occurs during the download, a message box will be displayed, otherwise the dialog box will simply close. Note: When you have a Rapise test previously loaded from SpiraTest or saved to SpiraTest then the standard Open and Save buttons should not be used. Suppose for example, you have some files modified locally and want to update them in the SpiraTest repository. When you click on the Save/Synchronize button, Rapise will show you which files have been modified locally and which have been modified in the central repository. The synchronization dialog either allows you to upload/download the revisions or keep intact the locally modified files depending on your choice. 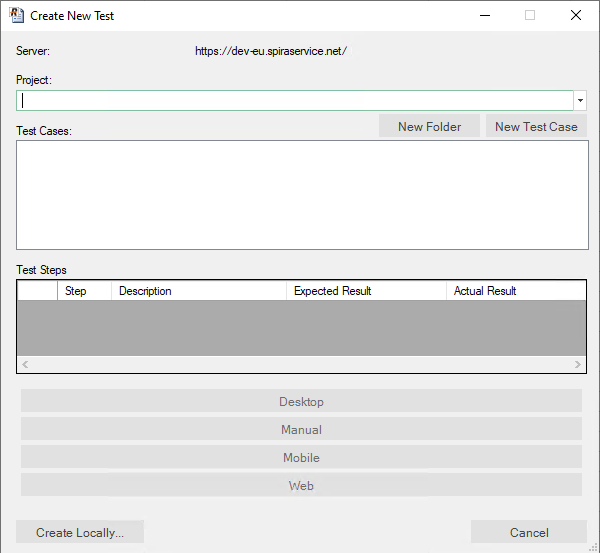 This will display the name of the current Rapise test together with the name of the SpiraTest project, test folder and test case that this test is associated with. If you would to save the current Rapise test into a new SpiraTest project or if you want to save it against a new test case in the same project, you must first unlink the test. To do this click on the Unlink from Test Case button. This will tell Rapise to remove the stored SpiraTest information from the .sstest file so that it can be associated with a new project and/or test case in SpiraTest. Warning: This operation cannot be undone so please make sure you really want to unlink the current test. In addition to using the menu options described in this page, you can interact with SpiraTest using the Spira Dashboard that is available from the View > Spira Dashboard menu. This provides a convenient way of interacting with SpiraTest, allowing you to quickly create, save and open test cases from SpiraTest. This code will check to see if the variables are provided by SpiraTest and if not, it will use some defaults. This is useful when you want to be able to run the test directly from Rapise and from SpiraTest without having to make changes to the test script. These global variables (g_book_name, g_book_author, g_book_genre) can now be used in the Rapise test script at the appropriate points in the playback. This tells Rapise to use either the g_browser_library variable (if defined) or fallback to using Internet Explorer if not. Note: Parameters in Rapise and SpiraTest are case-sensitive, so make sure that your parameter names in SpiraTest match those in Rapise exactly, including the specific case. Now that we have our Rapise automated test uploaded to SpiraTest and associated with a test case, we can now schedule the test to be executed. The first thing we need to do is setup the list of automation hosts. When you execute Rapise automated tests from SpiraTest, you have the ability to specify which computer(s) it will be executed on. We call those different computers, the automated hosts. Each automation host needs to have a copy of Rapise installed on it. Make sure that you have created an Automation Host for each computer that is going to run an automated test case. The name and description can be set to anything you like, but the Token field must be set to a unique name for each computer. Once you have at least one Automation Host configured, we need to next create the test sets that will be scheduled to execute on these hosts. Note: Unlike manual test cases, automated test cases must be executed within a test set -- they cannot be executed directly from the test case. Enter the parameter values and click Save to commit the change. 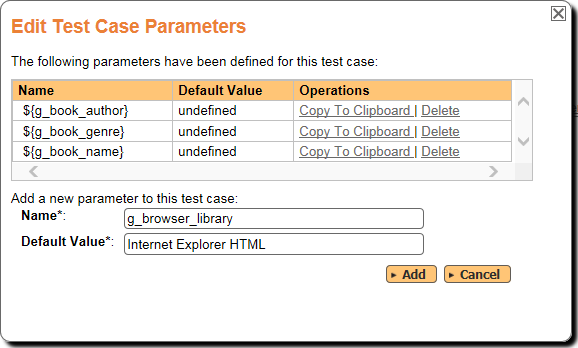 This allows you to have the same test case in the test set multiple times with different data for each instance of the test case. Automation Host -- This needs to be set to the name of the automation host that will be running the automated test set. Planned Date -- The date and time that you want the scenario to begin. Note that multiple test sets scheduled at the exact same time will be scheduled by Test Set ID order. Status -- This needs to be set to Not Started for RapiseLauncher to pick up the scheduled test set. When you change the Planned Date, the status automatically switches back to Not Started. Type -- This needs to be set to Automated for automated testing. 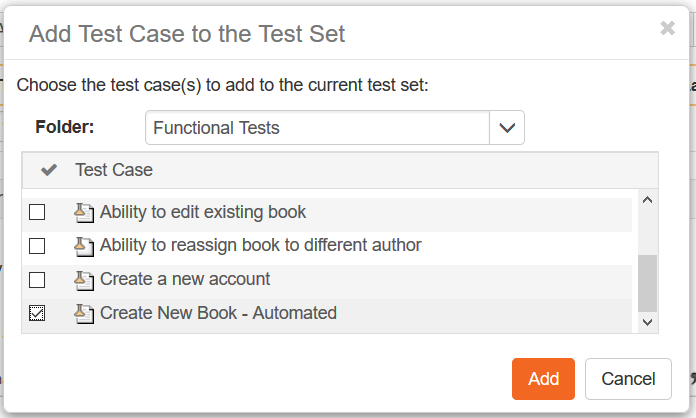 Once you have set the various test set fields (as described above), the RapiseLauncher instance running on the assigned automation host will periodically poll SpiraTest for new test sets. Once it retrieves the new test set, it will add it to its list of test sets to be execute. Once execution begins it will change the status of the test set to In Progress, and once test execution is done, the status of the test set will change to either"Completed -- the automation engine could be launched and the test has completed -- or Blocked -- RapiseLauncher was not able to execute the automation test. If you want to immediately execute the test case on your local computer, instead of setting the Automation Host, Status and Planned Date fields, you can instead click the Execute icon on the test set itself. This will cause RapiseLauncher on the local computer to immediately start executing the current test set. Passed -- The Rapise automated test ran successfully and all the test conditions in the test script passed. Failed -- The Rapise automated test ran successfully, but at least one test condition in the test script failed. Blocked -- The Rapise automated test did not run successfully. If you receive the Blocked status for either the test set or the test cases you should open up the Windows Application Event Log on the computer running RapiseLauncher and look in the event log for error messages. 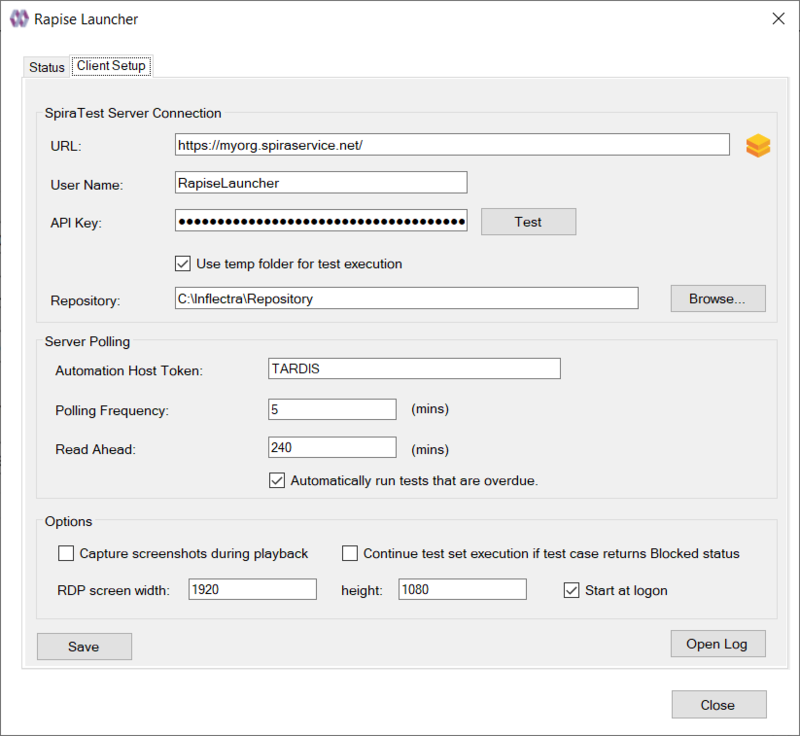 Note: While the tests are executing you may see browser or application windows launch as Rapise executes the appropriate tests. 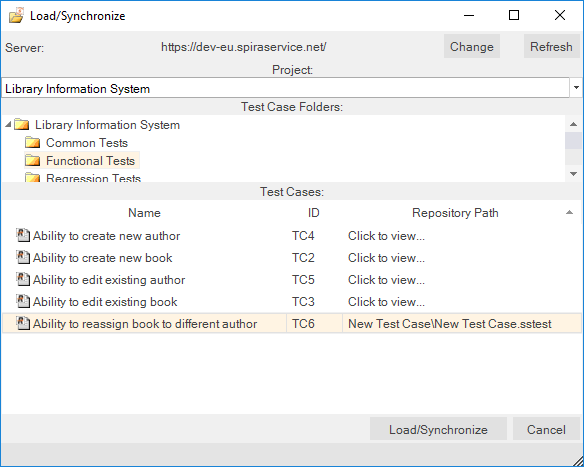 So, you now have a complete record of the automated test execution in SpiraTest, with the execution status of the appropriate test case and test steps updated, and a complete log of the testing activities. 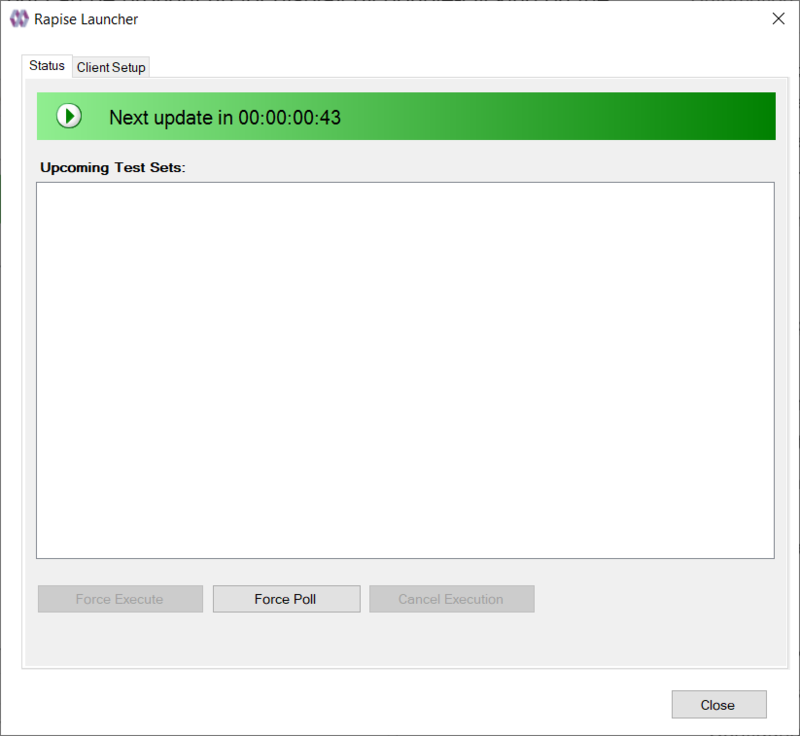 RapiseLauncher is a separate application that installs with Rapise. It allows you to remotely schedule the automated tests in SpiraTest and have RapiseLauncher automatically invoke the tests according to the schedule. When run, the program will start minimized to the system tray and will start its polling of the server. Polling will occur every 'x' minutes (5 by default) for any automated test sets that are scheduled to be run. When time comes for a test to be launched, it will start Rapise to execute the test. Rapise will then perform the test activities and report the results back to SpiraTest. At the end of the test, the program will go back and resume scanning for tests that need to be executed. Typically (unless there is a bug in the test or application being tested) no user input is ever needed from the application itself. By right clicking on the system tray icon and selecting Configuration, the application's window will open to the configuration panel. Server URL: This is the URL of the SpiraTest installation. Be sure to not put /Login.aspx or any other page in the string, this should be just the root URL of the application's install. Login Username: This is the SpiraTest login id of the user that you want the tests reported as. Note that while the application is polling and updating test results, if the user is logged into a web browser session, they will get kicked out. Login Password: The password to the Username above. Test: Clicking this will test the login to make sure the application can connect to the server properly. Repository -- this is the Windows folder that used to store local copies of the non-absolute repositories (downloaded from SpiraTest). 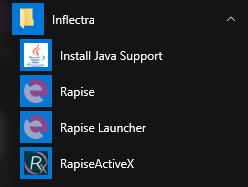 Use Temp Folder for Test Execution -- this should be enabled if you are also writing tests on this computer using Rapise and you don't want RapiseLauncher to download and overwrite any changes you have made locally (that have not been saved). Automation Host Token: This field is required, and uniquely identifies the local testing machine. Any scheduled tests assigned to the Automation Host on SpiraTest will get polled for this machine. Except in special circumstances, this ID should be unique among all testing machines. Important: This field must match the string that is entered into the Automation Host Details screen in the Token: field, or scheduled tests will not be recognized. Automatically Run Overdue Tests: When this is checked, any tests that are pulled from the SpiraTest server that has a scheduled date in the past will be marked as Overdue. Normally, overdue tests will not be executed. With this check, they will be executed as soon as the poll is finished. Polling Frequency: How often in minutes the application will poll the SpiraTest server for updates to the automation host's schedule. The default is 60 (1 hour), and should be fine for most installations. Note that tests will still be executed on their scheduled time, this is simply how often the program will talk to the SpiraTest server to detect schedule changes. Updating the polling frequency will reset the currently running timers. Polling Read Ahead: How far ahead in minutes the program should read the schedule for the Automation host. Tests that are scheduled farther in advance will not show up as a pending test on the status screen. Capture screenshots during playback -- selecting this option will instruct RapiseLauncher to capture screenshots of the objects being recognized during testing and upload them to SpiraTest at the end of the execution. The screenshots will then be linked to the test run inside SpiraTest. Green Arrow: A green arrow indicates that the test is still running, or RapiseLauncher is waiting for a reply from Rapise. Blue Checkbox: A blue checkbox indicates that the test is completed, regardless of status of the individual test steps in the scheduled test set. Red Error: A red error indicator indicates that Rapise ran into an issue (outside of test results). In this case, any further tests will be marked as blocked, as the issue needs to be corrected within Rapise or the Rapise test script. No Indication: No indication means that the test is currently awaiting for its scheduled date to start. Note that only one test will be launched at a time, so that if two tests are scheduled at the same time, the one with the lower TestSet ID will be executed first, then as soon as it's finished, the second scheduled test will be run. By highlighting a test that has not been executed yet, you can click the Force Execute button. This will cause the selected test to have its scheduled date to the current time, causing it to be immediately executed (or, if another test is already running, next in line for execution). At any time the Force Poll button can be clicked, causing RapiseLauncher to initiate an immediate poll of the SpiraTest server to check for pending runs. The timers for the next server poll will be reset when the button is clicked. Pause / Resume: The Pause/Resume option pauses or resumes the timers for polling and executing tests. If a test or server poll is already in progress, it will not cancel these. However, after the are finished, no further polls or tests will be run. Poll Now: This will force a server poll for upcoming tests, and reset the poll timer. Configuration: Opens the main window to the Configuration page. Help > About: Opens the About window, which displays information about Rapise Launcher. Help > View Help: Opens this help page. Exit: Will completely exit the program. Doing this will cancel any tests currently running and shut down the program. Any tests that were waiting to be executed will not execute until the program is restarted and the polling is resumed. You can double-click the tray icon to bring up the main window on the Status page. 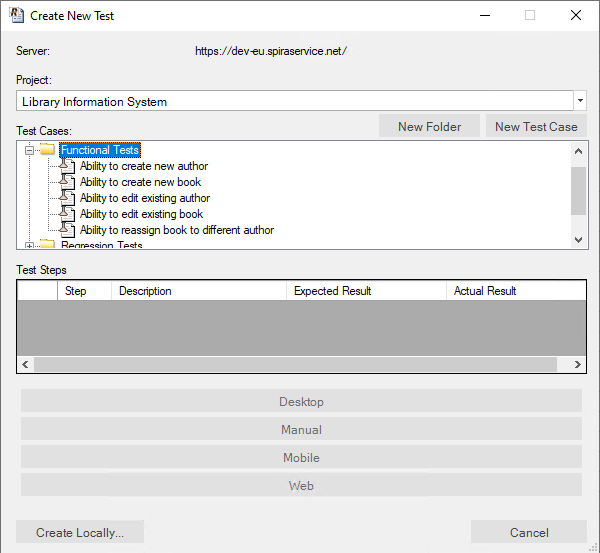 Normally you schedule tests in SpiraTest using the Planned Date field of the test sets and let the various instances of RapiseLauncher poll SpiraTest for upcoming tests. 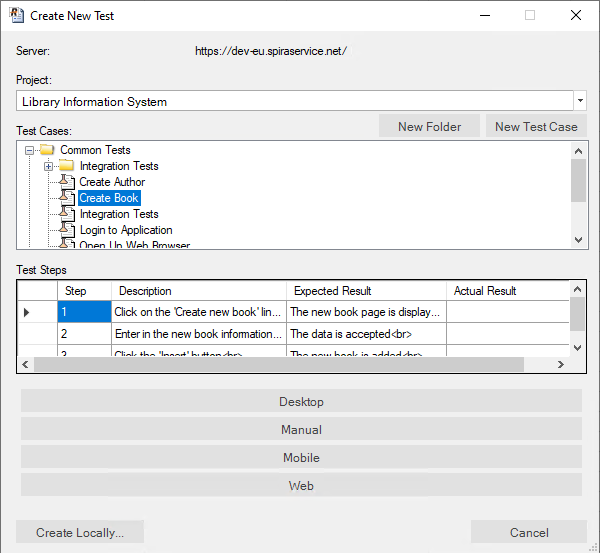 In addition (as described in the SpiraTest User Manual) you can execute a test set on the local machine immediately by clicking the Execute button within SpiraTeam. 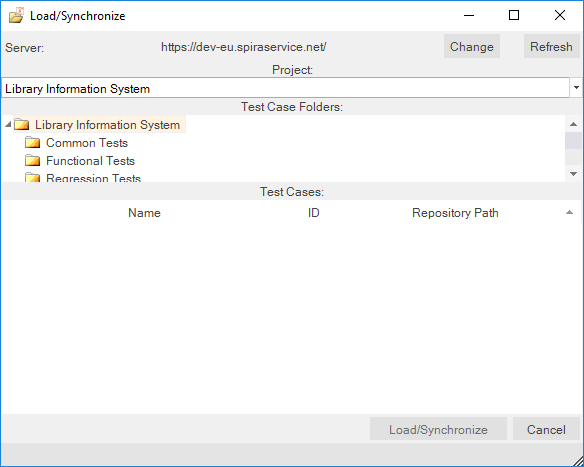 However there are situations where you want to be able to launch an automated Rapise test script from an external batch file or build script (e.g. as part of a continuous integration environment) and have those tests report their results back into SpiraTest. You can achieve this by using the special command-line argument --testset which is passed to RapiseLauncher. For more details on this parameter see the next section. -status shows the Status screen upon startup. (Normal action is to run minimized to the system tray. -paused starts the application with timers Paused instead of active. -trace enables tracelogging to the EventLog for debugging and watching tests execute. logfile forces events to be written to a text file instead of the Application EventLog. This option enables -trace as well. Files are located in the Local Application Data folder. -testset:[Test Set ID] allows you to tell RapiseLauncher to execute a specific test set on the remote computer (e.g. -testset:45 runs test set TX00045). -project:[Project ID] allows you to tell RapiseLauncher which project the test set specified with the -testset argument lives in. This speeds up the time it takes Rapise to locate and retrieve the test set (optional). must be the last item on the command line. This is a TST file downloaded from SpiraTest to start immediate execution on.